In support of their newly released and highly acclaimed album High As Hope, Florence + The Machine stopped by the SiriusXM studios for a four-song session that included an elegant rendition of Fleetwood Mac’s “Silver Springs.” Florence Welch sang the classic 1976 B-side over a graceful piano and acoustic arrangement; her powerful voice is sure to make Stevie Nicks proud. During the session, they also performed High as Hope songs “Hunger” and “Sky Full of Song,” as well as “Cosmic Love” from 2009’s Lungs. 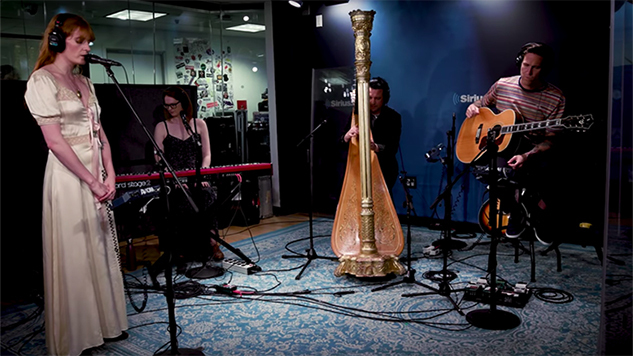 Listen to the audio of the “Silver Springs” cover and watch the other performances from the SiriusXM set below. You can also read our review of High as Hope here.